Cotija cheese is a popular Mexican variety of cheese that feels and is used similarly to Italian Parmesan cheese. The texture is crumbly and dry, and the flavor is salty and very concentrated. 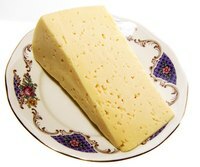 Cotija cheese is used in recipes such as tacos, soups and salads, and even as an additive to potatoes or beans. You can purchase cotija cheese in Mexican grocery stores or Latin markets, or you can make your own. The process may take a try or two to get it exactly right, but hang in there and you'll be successful. Warm the milk in the cooking pot to 100 F. Once the milk is warmed, add the calcium chloride and bacteria culture tablet. Keep the mixture at a constant temperature of 100 F through the end of Step 3. Stir the mixture for 20 minutes at medium speed using your mixer. After 20 minutes, add 1/2 cup salt. Dissolve the rennet tablet in the cool water. Slowly add this to the milk mixture, allowing the mixer to stir the milk mixture for another 5 to 10 minutes. Remove the mixture from heat. Allow the mixture to rest for 45 to 90 minutes. After resting, the mixture will have solidified to a soft curd. Break the mixture into smaller curds, about 1-inch cubes, using your hands, a knife, a spoon, or whatever works for you. Let the curds rest for another 10 minutes. Pour the mixture through a cheesecloth to remove the whey (the watery mixture in which the curds are floating). Place the drained cheese into a cheese press, and press for 30 minutes. Then, flip the cheese in the press, and press for another 12 hours. This removes any excess moisture and allows the cheese to harden. Prepare a brine solution of 1 1/2 cups salt in 1 quart of warm water. Allow the solution to cool to room temperature. Carefully remove the cheese from the press (it will still be soft). Soak the cheese in the brine for 30 hours, flipping the cheese every 10 hours to encourage rind development. The rind is the hard coating on the outside of cheese. Remove the cheese from the brine, and place in your refrigerator for 2 weeks to allow it to ripen. Check the cheese for mold. If any mold grows on the rind simply wipe it away with a paper towel or cloth. Do not wrap the cheese while it ripens or it will not ripen properly. Store the cheese in an airtight container once it has ripened. You can purchase specialty cheese making products, such as the calcium chloride, rennet, bacteria culture and cheese press, in cheese making supply shops or online. You can also find many of them in prepackaged cheese making kits.